One band not making those wrong mistakes is saxophonist Stephen Gauci’s quartet. Its eight Monk covers begin with a bold confidence and ply a determined vigor to this famed canon. Thunk! opens with a hint of funk, as bassist Michael Bisio and drummer Jeremy Carlstedt stroll New Orleans for a pulse. By the time guitarist Kenny Wessel and Gauci enter, the die has been cast. These cats muscle “Bemsha Swing” more as jazz-funk than bebop. While aggressive, the music never comes off as irreverent. Gauci has shared a regular collaboration with Bisio in the bassist’s quartet; Bisio also appears on pianist Kris Davis’ stellar Three (Clean Feed, 2010), and on Gauci’s twin-bassist Basso Continuo group, on Nididyhasana (Clean Feed, 2008). Tracks like “Monks Mood,” “Well You Needn’t” and “Off Minor” are played as if pushed by a pugnaciousness that is more New York brusqueness. Credit Bisio’s hand, and the producer’s choice to mix the drums upfront. Gauci’s choice of notes, as his selection of players dictates this mood. The discovery here is Wessel. He favors a supportive role when Gauci solos, but stitches together a running commentary throughout tracks like “Nutty” and dresses up “Ask me Now,” in duo with Gauci, that simply elevates the track into a dream state. Gauci’s Thunk! book is a veracious take on the brilliance of Thelonious Monk. Though still best known for his 12-year tenure with Ornette Coleman as one of the twin engines powering Prime Time, guitarist Kenny Wessel has carved out a niche as a thoughtful player who explores structure and freedom across a range of genres. Wessel shares equal billing with the three other participants on Thunk!, a collection of eight familiar Thelonious Monk charts, dressed in new clothes by the band. By now there’s nothing remarkable in having a piano-less interpretation of the Monk canon, but they execute it with such a sense of fun that it’s hard to quibble about the need. Leading the frontline alongside the guitarist is the sweet-toned tenor saxophonist Stephen Gauci, coming out of Coltrane but with a beautiful wavering delivery on the ballads that evokes Archie Shepp. On drums Jeremy Carlstedt proves to be a sensitive accompanist, but it is the inventive bass playing of Michael Bisio that elevates this session out of the ordinary. His repeated patterns drive the uptempo rendition of “Bemsha Swing” while he uses the first two notes of the theme as an underlying motif in a multi-tempo version of “Nutty”, which inspires both Wessel and Gauci to strong statements. Bisio’s arrangement of “Let’s Cool One” reimagines the tune as a sort of lilting bossa nova, with a free section to spice up the solos. Wessel’s finest moment comes on an arrangement of “Off Minor”, which has a hint of the Pink Panther refrain and a ringing bass figure, before moving away from Monk with an angular darting guitar solo. Carlstedt has to wait to the last for his opportunity to shine, between the staccato phrasing of “Well You Needn’t”, which, as with the rest of this likeable disk, rejoices in subtle but involved interplay. 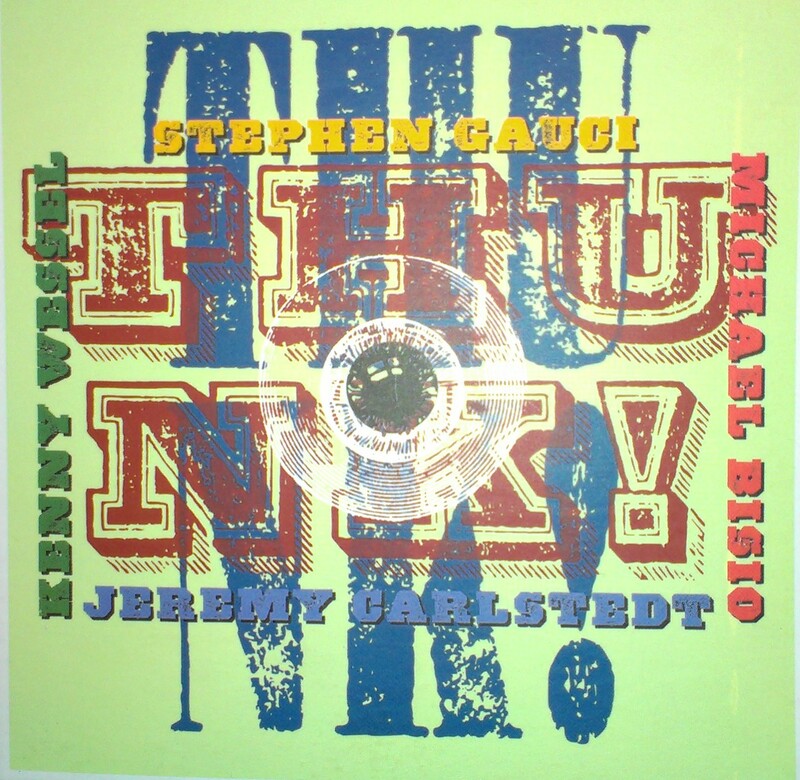 Stephen Gauci is a tenorist that’s getting things very together with a series of his own recordings and as a member of Michael Bisio’s group. This time out he gets a nice combination of self, Mr. Bisio on bass, Kenny Wessel on guitar and Jeremy Carlstedt on drums. I’ve seen that they’ve been gigging around the city. Alas I’ve never have been able to catch them due to everyday snarls and SNAFUs. But the album gets their music down for us all to hear. We have a good sampling of classic Monk tunes, like “Ruby My Dear” and “Nutty”, only it’s arranged subtly, differently, sometimes with a straight-eight funk feel, sometimes by extending a harmonic section, adding an ostinato, all good ideas. Stephen sounds great, Kenny Wessel really comes on, Michael Bisio is his usual outstanding self and Jeremy Carlstedt does everything right. So it’s not “just” another Monk tribute. These guys have been playing the tunes for a long while and the arrangements seem like they evolved out of thinking about and dealing with the music, not as a grafting. It all rings out true and plumb without missing soul and expression! Stephen Gauci is a player you need to hear and this is a perfect place for that. Listen up and liken it up? You no doubt will. We have now lost count of the jazz musicians who have been inspired by Thelonious Monk, sometimes confining orthodoxy all loyal to the dictates of a mainstream school, sometimes moving in directions more avant-garde, as did the pianists John Stetch and Alex von Stetch Schlippenbach. Stephen Gauci belongs to a third category, that of the musicians who have internalized the escape from the orthodoxy that the spirit of Monk has always been. And so we find ourselves at the beginning of disc with “Bemsha Swing” played on an almost funk rhythm, which bodes well for the rest of the disc. Here are more abstract atmospheres, with “Ask Me Now”, introduced by guitar and sax duo, with only the bass to act as support, are produced in imaginative interpretation; pure poetry told in music. “Let’s Cool One” breathes the air of the more mainstream, as well as “Monk’s Mood”. “Nutty” on Kenny Wessel’s electric guitar has the upper hand: the beautiful solo, modern at the right point. Stephen Gauci is obviously present everywhere, but his best solo takes it out on “Ruby My Dear”, formally perfect and full of feeling. Of the value of the musicians there is little to add, except that the great bassist Michael Bisio is unfortunately little known in Europe, while drummer Jeremy Carlsted creates a subtle swing that permeates the entire disk. This homage to Monk Quartet Gauci takes nothing for granted. That’s what happens when people decide to make the avant-garde a tribute to the great tradition of capturing the spirit rather than the formal aspects.